I stated in an earlier Rosebank article how generous folk in the whisky community are and how you should treat others how you would want to be treated. This dram comes from the Whisky Collector who has a tremendous bar in Dornoch, Sutherland. It is highly recommended and a place where very rare whiskies are available by the dram for reasonable prices. Standing in the queue to bottle my own single cask Glenfiddich I put the word out Twitter and Whisky Collector fancied a bottle. A coincidence as after the festival we were heading north to Sutherland anyway, so I was able to drop by and hand it in. As a thank you I was offered the opportunity to pick out a sample to take home; now talk about a kid in sweetie shop! In these situations its hard to lock onto targets as the choice is so great. My usual tactic is to rely on a recommendation so this Macallan was highlighted along with a Bunnahabhain. Obviously given this piece, I went with the Macallan which was distilled in 1963 and now sells at auction for nearly a grand. I hear a great deal about how the Macallan as a whisky today isn’t on the radar of most enthusiasts. It exists for collectors and status seekers in foreign markets. I will say I enjoyed the recent 18 year old but not as nearly as much as this expression. 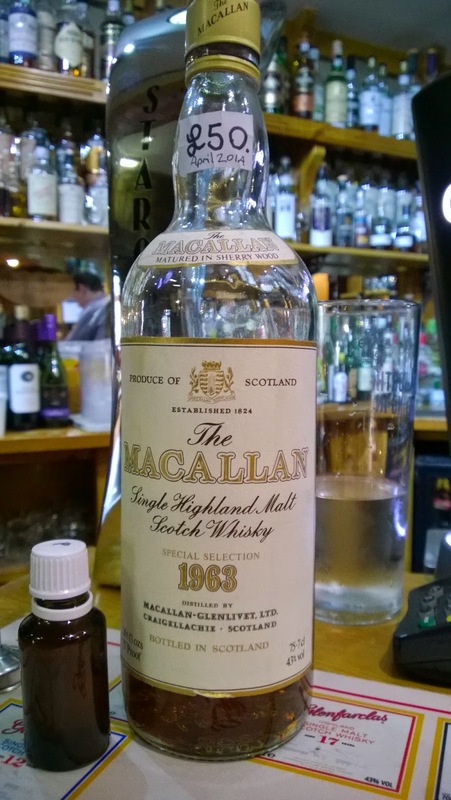 If you have the opportunity to try one of these old school Macallan’s then take it. Colour: a dark rich amber – lovely! On the nose: what a blast! It’s almost like wandering through an old car scrap yard with the air filled with rust; like ramming your nose onto a rusty nail. Beyond this the richness of sherry dominates with sultanas, waxed leather, crushed mint and rich red cherries. A rum note, baked figs with honey and cinnamon. Really, the 1824 series bares no relation to this old style Macallan. In the mouth: dark chocolate and ginger once you get beyond that big sherry impact. Black treacle, roasted chestnuts on an open fire and mocha. A lovely subtle brown sugar finish that leaves you wanting more. I could dissect this all night for you if I actually had the full-sized bottle. Well, they certainly don’t make Macallan’s like this anymore although I did enjoy the current 18 year old, there is something more robust and colossal about this expression. If I can level a minor criticism this would be another level if it wasn’t watered down to 43%, still a lovely drop. The nearest modern day equivalents are what GlenDronach are currently doing with their sherry casks. The Macallan is out of reach of most whisky enthusiasts nowadays with examples being traded like stocks and shares. It’s a realm I’ve never dared.. So finally, the Macallan 1824 series has arrived at retail. Excuse me if the excitement is barely noticeable amongst UK whisky drinkers. I was able..